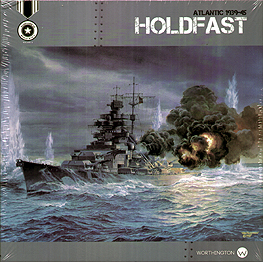 Holdfast Atlantic recreates the ship battles contesting control of the Atlantic Ocean during World War II. The navies of Britain and the United States are challenged to keep sea lanes open for its convoys. German U-Boats prowl these waters and German and Italian battleships and cruisers threaten the sea supply lines of the Allies. The great Axis warships Bismarck, Tirpitz and others contest Britain's best while the United States fleet adds its might to the fight as the war progresses. As the Axis player can you cut the sea lanes that supply Great Britain and Russia to win the war? Or as the Allied Player, can you overcome the U-Boat menace and Axis naval and air forces to control the Atlantic. Holdfast Atlantic is the 3rd volume in our Great Campaigns of World War 2 series. The game uses area movement to contest, battle and control the key Atlantic areas in the war. Using wooden blocks with labels as the ships of the great Allied and German fleets, players have hidden movement and battle for control of each sea area. The game also highlights the fierce struggle of convoys supplying the Allies and the menace of German U-Boats trying to sink them.